The administrator of NOAA warned lawmakers this week the United States could face eroding weather forecast capabilities due to insufficient funding for the Joint Polar Satellite System, a new series of civil spacecraft to monitor severe storms, observe major disasters and collect information for long-term climate prediction models. Like many federal agencies, NOAA was hit with a significant funding reduction in the budget bill passed by Congress Thursday. The agency's procurement budget, which includes satellite development, was reduced by $25 million from the 2010 level to $1.34 billion through the end of September. That's more than $700 million less than the spending requested by NOAA for fiscal year 2012, which begins Oct. 1. Agency leaders maintain that is the budget necessary to keep its satellite programs on track, especially the next-generation polar-orbiting JPSS constellation. 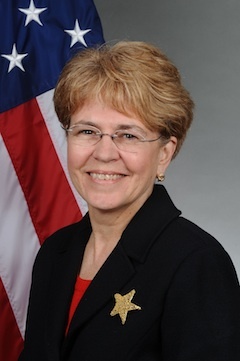 Jane Lubchenco, NOAA's administrator, told the Senate Commerce Committee's oceans, atmosphere, fisheries and coast guard subcommittee Wednesday that the budget legislation then under consideration would "almost certainly" lead to a gap in weather coverage. "I think it's safe to say there will almost certainly be a gap in coverage that, at this point, looks like it might be at least 18 months," Lubchenco said. The data gap could start as soon as 2017, according to Lubchenco. Congress passed the budget bill Thursday and sent it to the White House for President Obama to sign it into law. NASA plans to launch a stopgap weather and climate research satellite named the NPOESS Preparatory Project, or NPP, into polar orbit in October. NPP has a five-year life span in space, meaning it could be lost by late 2016 or early 2017 if its operations cannot be extended. The launch of the JPSS 1 satellite will occur in September 2016, at the earliest. And that's only if funding is doubled soon, which isn't likely in the current budget environment. It's more likely the launch could be pushed back to 2018, officials said. Sen. Mark Begich, D-Alaska, said he and other senators attempted to raise support for more JPSS funding in the federal budget, but their efforts were shot down in the name of fiscal austerity. "There will be a data gap," Lubchenco told Sen. Begich. "That data gap will have very serious consequences for our ability to do severe storm warnings, long-term weather forecasts, search and rescue and good weather forecasts for your state." Alaska is best served by polar orbiting satellites like those envisioned for JPSS because the state is too far north for good coverage by NOAA's high-altitude geostationary weather satellites over the equator. Stood up after the break-up of the behind-schedule, over-budget National Polar-orbiting Operational Environmental Satellite System in February 2010, the JPSS program is one-half of the planned U.S. weather satellite fleet in low-altitude orbits. NPOESS was a combined program between NOAA and the U.S. Air Force, so the military started the Defense Weather Satellite System last year to continue the Pentagon-run weather observation network. 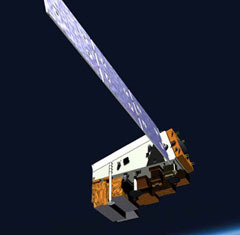 Artist's concept of the JPSS 1 satellite in space. Credit: Ball Aerospace and Technologies Corp.
NOAA has been trying to start the JPSS program with a fraction of the money needed. The agency redirected its half of the NPOESS budget toward JPSS, but it wasn't enough to get the new program off to a healthy start. Preston Burch, the NASA manager in charge of developing JPSS satellites, said in February that instrument and spacecraft design work was being significantly curtailed due to budget constraints. The JPSS 1 satellite is a clone of NPP with the same instruments and a nearly identical spacecraft bus built by Ball Aerospace and Technologies Corp. Managed by NASA, NPP was originally conceived as a risk reduction and gap-filler satellite for the NPOESS program's high-tech sensor suite and NOAA's polar satellite fleet. Now, the satellite that was once an insurance policy may still not be enough to ensure weather data continuity from polar orbit. "Our spacecraft contract we have is on life support," Burch said in Feburary. "You can envision the patient with a breathing tube, IV drips, a heart monitor and everything. It's just trickling along at a pathetically slow rate because we don't have money. We don't even have money to buy long-lead items for it. That's really what's pushing the launch date out." NOAA, the U.S. military and Eumetsat, Europe's weather satellite operator, share responsibility for global coverage in three different types of polar orbits. The Air Force is primarily interested in an orbit in which satellites fly over regions on Earth in the early morning, while Eumetsat and NOAA assets cover mid-morning and afternoon orbits, respectively. Because NOAA has sole responsibility for the afternoon orbit, there aren't any backup options if JPSS is still grounded when NPP goes dark. "There is no other polar-orbiting satellite that will be flying in the orbit that JPSS was intended to fly in, so that's why there will be a data gap. There is no redundancy," Lubchenco said. Cutting money from the JPSS program now will not necessarily lead to savings in the long run, according to Lubchenco. "I can tell you that for every dollar we didn't spend this year on JPSS, we will need to spend three to five dollars down the road because we have to cancel the contracts, we have to let people go," Lubchenco said. "These are very sophisticated, skilled workers, and then you need to bring the programs back up." NOAA officials say satellite data, including that from polar and geostationary platforms, provide about 98 percent of the information going into the numerical weather models forecasting long-range conditions on Earth.